American architecture firm Johnston Marklee has completed a cultural building in Texas, with a white linear form punctured by courtyards. 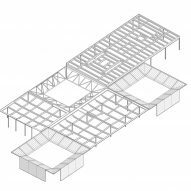 Menil Drawing Institute is the fifth art building to join the Menil Collection's 30-acre (12-hectare) campus in Houston's museum district. The institute showcases modern and contemporary drawings from the private collection of John and Dominique de Menil. 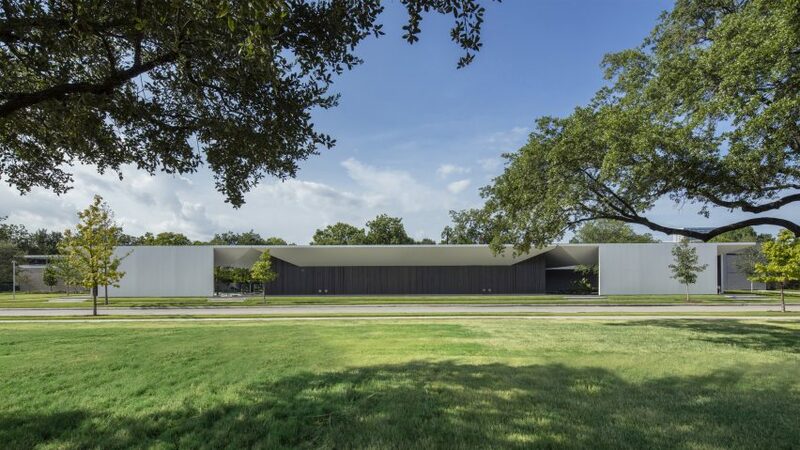 Founded in 2008, the Menil Collection campus includes the main museum building, the Byzantine Fresco Chapel, the Cy Twombly Gallery, the Dan Flavin Installation at Richmond Hall, and the independent Rothko Chapel. With offices in Chicago and Los Angeles, Johnston Marklee was selected to design a new home for the drawing institute in 2012. 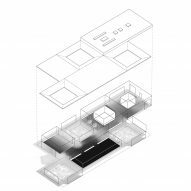 Measuring 30,146 square feet (2,800 square metres) across a single storey, the building has a simple white exterior and is peppered with courtyards. 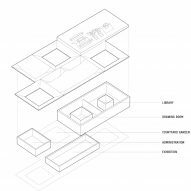 "The Menil Drawing Institute is the first freestanding facility in the United States created especially for the exhibition, study, storage, and conservation of modern and contemporary drawings," said a statement from the museum. A combination of painted white steel plates, stained Port Orford cedar, concrete, and steel-framed glazing were used to construct the building. The interiors comprise white walls, glass, white oak floors and moments of concrete. 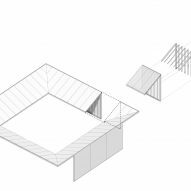 The architects opted for an "intermediate scale" for a museum building, in response to the works to be displayed inside and other structures in the vicinity. 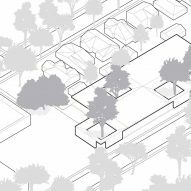 "The Menil Drawing Institute is midway in size between the domestic architecture of the surrounding bungalows and the institutional architecture of the main museum building," said the statement. The building is surrounded by a grassy lawn and oak trees, while a trio of gravel courtyards are found within its envelope. Landscaping for the project was completed by Michael Van Valkenburgh Associates. 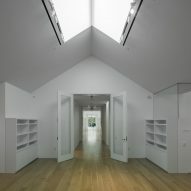 The courtyards and a series of smaller diffused skylights naturally illuminate the galleries, housed within box-like volumes linked by a thin, white folded-steel roof. From the edges of the building, sections of the roof angle down towards the tree-planted courtyards – a feature made more prominent by open corners. 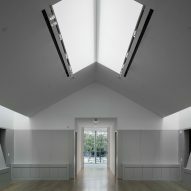 "As visitors approach and enter the Menil Drawing Institute, the design naturally and incrementally reduces the intensity of the sharp Texas sunlight by means of the canopy of the surrounding trees and the roof canopy of the building," said the statement. "The roof appears to float in the landscape when viewed from a distance, pierced intermittently by the treetops." A central "living room" runs from the west and east entrances, and serves as the institute's circulation spine. To the south are exhibition galleries, while offices, study rooms and a conservation lab are positioned to the north. 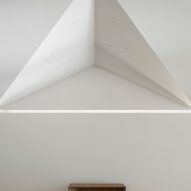 Some rooms feature angular ceilings formed from triangular facets, while others have gabled pitches. "The design achieves an unprecedented interplay between indoor and outdoor space in a facility for highly light-sensitive works on paper," said the statement. Johnston Marklee also designed benches, tables, ottomans and desk accessories for the institute, in collaboration with California craftsman Jeff Jamieson, who frequently worked with late American artist Donald Judd. 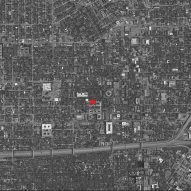 The masterplan for the Menil Collection campus was overseen by David Chipperfield, who was selected for the project in 2009. The Menil Drawing Institute is set to open to the public 3 November 2018. Photography is by Richard Barnes.